Comprehensive review of Shiseido Brilliant Bronze Quick Self Tanning Gel. See what the experts and actual users have to say about this self tanning product. Shiseido Brilliant Bronze Quick Self Tanning Gel is a very, very good product. It’s one of the easiest self tanners to apply, it dries lightning quick, smells good and gives good color. It’s only real downside may be the fact that it won’t get you very dark– this is more of a light self tanner. Even so, this product is one of the better ones out there and is certain to make our top 10 list very soon! 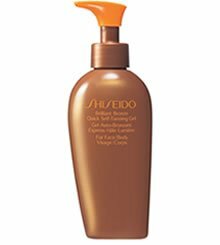 Shiseido Brilliant Bronze Quick Self Tanning Gel comes out of a hard plastic bottle (with pump) as an extremely light, clear gel. It feels almost like nothing… slightly thicker than water itself! This product is extremely easy to apply. It goes on smooth and rubs in with virtually no effort. Because it dries so fast, this is one you’ll want to put on fast so you know where you’ve put it. It doesn’t have a guide or any tint to it as well. Shiseido’s Brilliant Bronze dries quicker than any self tanner we’ve ever tested. And because of that, it’s super clean ad definitely doesn’t get on your sheets or towels. If you’re one of those people who hates how messy some self tanners can be, this is the product for you! This one has a very unique smell. It’s clean and fresh smelling but nor overpowering. The smell of this one is virtually gone the next day. We didn’t detect very much of that ‘self tanner smell’ that everyone hates. Shiseido Brilliant Bronze Quick Self Tanning Gel produces a nice, light shade of bronze. For most people, I think it’ll work fine. But for those who like to be a little darker, this may not quite get you there. Shiseido’s Quick Self Tanning Gel lasts about 4-5 days, which is about average for high-end products. One good thing– it comes off pretty evenly and without a lot of patchiness or blotchiness. This is a great product for guys because it goes on easily and dries quickly. The fairly neutral smell is another plus. The color is also great for guys who don’t want to look ‘fake tanned’. In fact, most people won’t even realizing you’re using a self tanner when you use this product! Shiseido Brilliant Bronze Quick Self Tanning Gel costs $30 for a 5.2 ounce bottle. That works out to $5.76 per ounce, which is expensive compared to cheap drugstore brands, but about average for higher-en d brands like this one. To buy Shiseido Brilliant Bronze Quick Self Tanning Gel, click here.